Click HERE to view the optional FAUCETS. Please return to this page and make your selection from the drop down menu. Fresca is pleased to usher in a new age of customization with the introduction of its Torino line. The frosted glass panels of the doors balance out the sleek and modern lines of Torino, making it fit perfectly in either ‘Town’ or ‘Country’ décor. 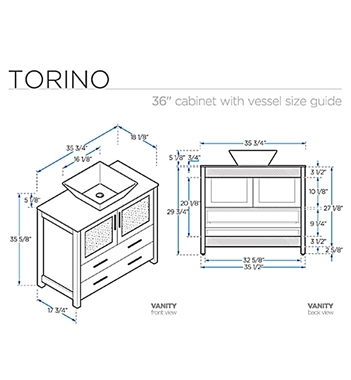 Available in the rich finishes of Espresso, Glossy White and Light Oak, all of the vanities in the Torino line come with either a ceramic vessel bowl or the option of a sleek modern ceramic undermount sink. Dimensions of Vanity: W 35.75" x D 18.13" x H 35.63"
Dimensions of Sink: 16" x 16" x 5"
Side Cabinet: W 12" x D 17.75" x H 28.13"
Copyright © 2011-2019 Vanities For Less. All rights reserved.